How it happened: The Knights, an NAIA program led by former Carmel head coach Scott Heady, kept it close for a half thanks to hot 3-point shooting. Marian was 6-of-14 from distance in the first half, but Indiana still held a comfortable 12-point lead at the break. Had a few late shot clock attempts not gone in for the Knights, Indiana probably would have led by closer to 20 at the half. The revamped Hoosiers looked more fundamentally sound defensively, particularly on the perimeter. Some rotations and closeouts were still sloppy early, but Indiana’s technique is clearly improved. And in the second half, the defensive intensity began to eat away at Marian’s legs as the Hoosiers pulled away for a comfortable win. It’s just an exhibition game, but the Archie Miller era got off to a positive start on Saturday night. 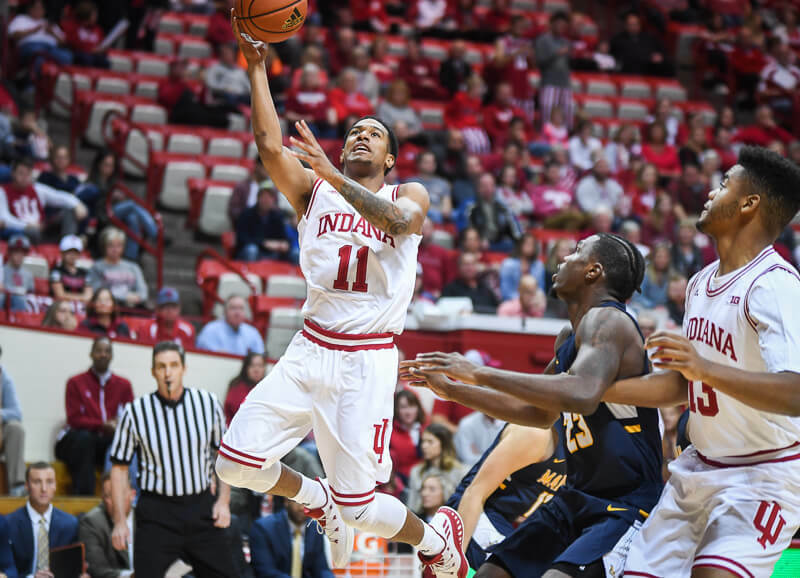 Standout performer: Sophomore Devonte Green picked up right where he left off at Hoosier Hysteria. Green was aggressive (and efficient) offensively as he finished with 22 points on 9-of-14 shooting. Beyond the points, Green also chipped in seven assists and six rebounds in 30 minutes. Statistics that stands out: Indiana held Marian to .86 points per possession and turned it over on just 13.6 percent of its possessions. RJ had an off night, tons of missed shots including layups. That won’t continue. A few more drop, and he’d have his 15.
exactly this. I’m pretty certain this is exactly what’s going to happen. 4 or so guys who average 14-15/game. Probably Morgan, RJ, DD, and DG. Hartman, Newkirk, and Smith maybe knocking on the door right behind them. Fair points and the skepticism this early isn’t misplaced. But I think you’re in for a surprise. He’s going to have his struggles and missteps, as all young players do. But he’ll be a star nonetheless. I do suggest that people pay more attention to his passing skills, too. DG is going to have his hands on a LOT of the offense, one way or another. I also expect him to start learning to pick pockets and get open breaks on his own, a la Oladipo. And half of the turnovers were by the freshmen. I think we’re going to like how this team grows through the season under Archie’s tutelage. Get where you’re coming from. I think DG has a bright future IF he continues to listen to Archie and play within the system. If he goes “rogue” and tries to take over games, he becomes almost useless to IU. Right now, JN is the better PG because you know he will stay within the system; knows the system; and has apparently, based upon the last games of last year and going off last night, solved the problems that plagued him. Please don’t go with the “Oh Great One” nonsense. Have always loved his passing! I think Collin will start and Devonte will be the 6th man. I just don’t see Collin coming off the bench, though I could certainly be wrong. Last year DG had a fantastic start, but an inconsistent year. It really is a tad early to start declarations like that. I’m on the DG bandwagon, don’t get me wrong, but as the rest of the guys settle into their games, things will probably change a little. And yet I am anointing! As you say, though, things will change as al the new players, new roles, and New schemes settle in. I do not think that DG is ready to carry the team with anything like the night in/night out consistency that an All-American like Yogi did. But both as matter of skill and as a matter of temperment, I think he has some attributes that no one else on the team does. As Ms. Hoosier points out, he just carries himself like he wants the responsibility. And as Archie has pointed out, he practices that way, too. No, he’ll have some downs in addition to the ups before he is a complete player who can bring 9 games out of 10, and others on the team will have big nights for sure. But he is the guy who will do most to drive the action with his own playmaking, and he is the guy we will most often look to (not always, just often) when we really need a basket or a big play. That’s how I see it, and I’m sticking to it until either a) he unexpectedly flops, or b) someone else unexpectedly stands up (and not just for a game or two, but for an extended stretch. The fact that he is a Sr and that he is healthy he would have played more. It would be great if gets 10 and 8. I really like him! He does all the dirty work. I don’t think I would call Archie an East Coast kind of guy. What is it that makes you say that? I agree. If my memory is correct DG led in scoring last year at HH and I think may have led, or been very close to it in scoring for the first exhibition game last year as well. He is showing good signs, but it was only a scrimmage and Marian. Let’s see how he looks when the real games start. I think he will definitely by a key contributor, but I am not ready to call him our star and leader just yet. Fair enough, but I can tell you from experience moving from Indiana to near Philly that the Pittsburgh area where Archie is from is much different from the true East Coast vibe. While it may be a little different from Indiana it is still much closer to a Midwest vibe than East Coas in my opinion. I have to say Arch, I agree with most everything you’re saying. I’m just trying to put the brakes on a little bit. I really don’t know why, other than I think a lot of folks (not pointing at you) are short-changing RJ and JM, and aren’t even thinking of CH. I really am very high on Devonte, and I believe he may become that go-to guy we’ve all been waiting to rise to the surface. I just think there are a lot of others to consider too. I think Devonte will, as Archie said, become a very important part of this team. No doubt in my mind about that. I just hope he stays consistent. We don’t disagree much. As I said in a previous post, I’m not saying the Devonte is ready to take over the team the way Yogi did, for example, just that he is our most dynamic playmaker and the guy who seems best suited for taking on the challenge of making something happen when we really need it. I agree entirely that other players can and will step up at times, and I would add JN to that list — maybe even above the others. A senior PG is is a great guy to look to for leadership in big moments, and he looks to me like he is willing and able to provide it. CH will be the heart of the team, but we need to see where he is physically before we say with certainty what he will be on the court. What I would say about him, RJ, and JM, with not the slightest bit of insult intended, is that they are (or at least have been for all their years thus far), role players. They do certain things well, play within themselves, and provide all the sinew that connects the team both on and off the court. I will be surprised if any of them ends up as our “go to” guy on a regular basis, but all will have a big part in our success regardless. Devonte sure made some beautiful passes last night. And looked very comfortable with the ball on the move. I like the “center of gravity” analogy, some guys play better in that role, some seem more comfortable as best supporting actors, all equally important. Great to see these guys playing again! I think it comes down to whether Archie goes with three guards or not. He says he sees situations where that won’t work, and if he goes with two guards then it’s a touch decision. DG is the best player on the team right now, probably — it’s hard to keep him out of the starting lineup. Maybe if CH starts it’s DG and RJ or maybe even DG and JN. I can’t see starting RJ over DG at this point. Look at his numbers though in just 17 minutes. If he plays closer to 30 minutes a game in the future, it wouldn’t be a stretch to assume he could average 12 and 8 rebounds, a few assists, a block or 2. Not bad at all! Obviously this is just one exhibition game so lets give it time. But I don’t see anything in the state line that looks discouraging.